Food deserts occur in urban areas when it becomes difficult to buy affordable or good quality fresh food. Hoping to put an end to this, restaurants and organisations are stepping up with affordable solutions, increasing access to nutritious alternatives. Among them are Everytable and Eatsa, two healthy-fast-food-joints. With their first location in opening in South L.A., Everytable is situated right in the middle of a food desert, in one of the city’s poorest areas. Many of the people living here do not own a car, and often the space between grocery stores is too great to meet the needs of citizens. Due to this, shopping often takes place in convenience stores or quick service restaurants. Everytable is hoping to put an end to this. By offering healthy food options, Everytable has created a unique pricing model meant to make proper nutrition available at any income. By charging different prices at different store locations, prices take into consideration the economic realities of the local community. For example, at the South L.A. location, food is selling for about $4 USD. Their downtown location, expected to open this month, will offer the same food for about $8 USD. All of the food offered by Everytable is cooked in a central kitchen in Redondo Beach by Chef Craig Hopson, of New York’s Le Cirque Fame. The food is then packed in to-go containers. Customers can grab-and-go, or heat the food up and eat in store. With this approach, Everytable avoids the cost of operating a full kitchen and staff for each restaurant. Each store is staffed with two people, mainly working the point-of-service machines. Everytable is one of many trying to change fast food for the better. Eatsa is another healthy-fast-food-joint that offers customisable quinoa bowls. Using the Eatsa app, or one of the in-store iPads, customers can build and order their own quinoa bowl. This means no cashier and no line; instead your made-to-order bowl shows up in a personalised cubby once prepared. Fresh and nutritious food should be affordable and accessible; Eatsa offers this along with tasty options and healthy portion sizes. Cities are also being innovative when it comes to food deserts. Last year, for example, we saw solutions in terms of Toronto’s Farmer’s Market on Wheels. This unconventional food truck functions as a mobile market, bringing healthy and fresh foods to Toronto’s food deserts where unhealthy foods is often the only option. If people can’t get to the food, why not bring the food to the people? Access to healthy, affordable food should be seen as a human right. By offering healthy, affordable food these restaurants and organisations are taking the first steps towards putting an end to food deserts. For years slicing döner meat was an ordinary human job in every kebab shop in every city on Earth. Forget about that — meet the kebab robot. But is it going to save the declining high streets? 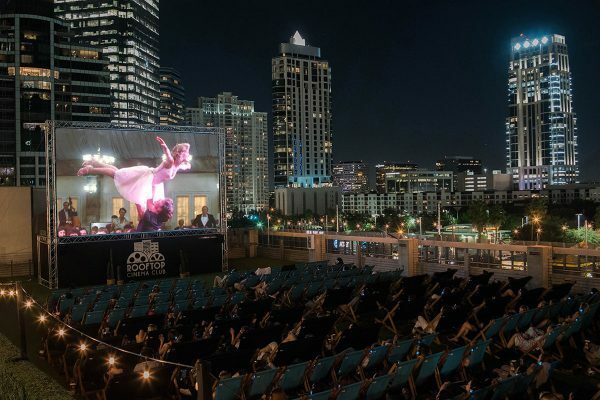 The Rooftop Cinema Club transforms urban rooftops across the United States and London into temporary neighborhood cinemas.